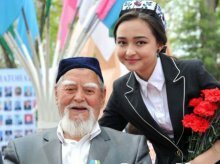 The project entitled "Professional social services for persons with disabilities and lonely elders in Uzbekistan" has been completed in the country. The scheme was realized in 2014-2016 and allowed to improve the lives of 17 thousand lonely elders and people with disabilities. Project events on improving the legislation and betterment of the social services quality were included in the State Program "Year of attention and care for the older generation" where the relevant ministries and agencies, the UNDP became co-executors. The categories of persons entitled to receive state social services and social assistance were expanded, in particular, lonely elders and disabled people who are not retirees (receiving aids by age) began to receive monthly food sets and hygiene products. Also, the list of food and goods provided monthly free for the lonely elders and disabled, has increased from 9 to 15 items, and the total value of the entire set - more than twice. Quarterly household rounds were conducted to identify lonely elders and disabled people who need help and were not covered by social services. In particular, during 2016 only for the city of Tashkent and Tashkent region, as a result of household rounds around 150 people were included in the supply program for free set of food and hygiene products, about 300 people launched to receive home-based care services. The maximum possible number of social workers visits to home care increased from two to seven days a week, advanced technologies of social work - case management, development of individual programs based on the evaluation of situations, evaluation of the need for constant care (Barthel and Lawton scales) were introduced, new training programs were implemented in the professional development system for specialists of health and social care, the relevant manuals were prepared and published.